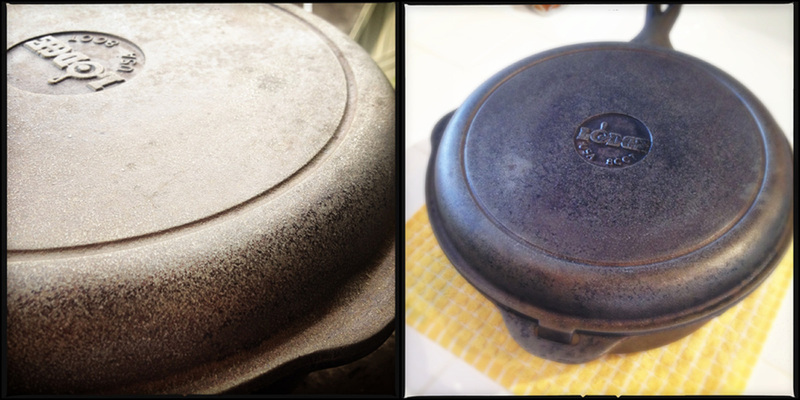 There’s something about dealing with cast iron cookware that has always been very daunting to me. It always seemed like so much. The seasoning, the cleaning and caring for it. It all seemed overwhelming. But, so many swear by it, and claim that everyone should have one in their kitchen. So, I decided to conquer those fears and take cast iron head on. Now, of course by now you might have noticed we’re not like a normal household around here. Any reasonable person would have gone and bought a cast iron skillet at their local store, maybe looked up how to do some extra seasoning on it, and gone on with their lives. But we’re The Melos! 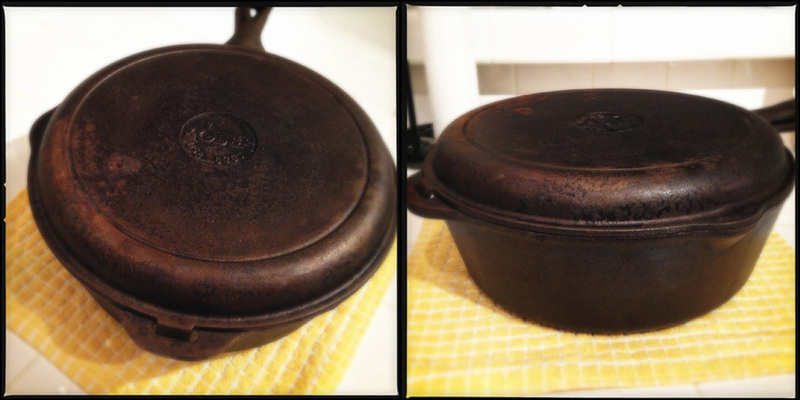 I had to go and find an old, rusty cast iron pan that I could rehab and bring back to its glory days! Otherwise, where’s the fun? So I did just that. 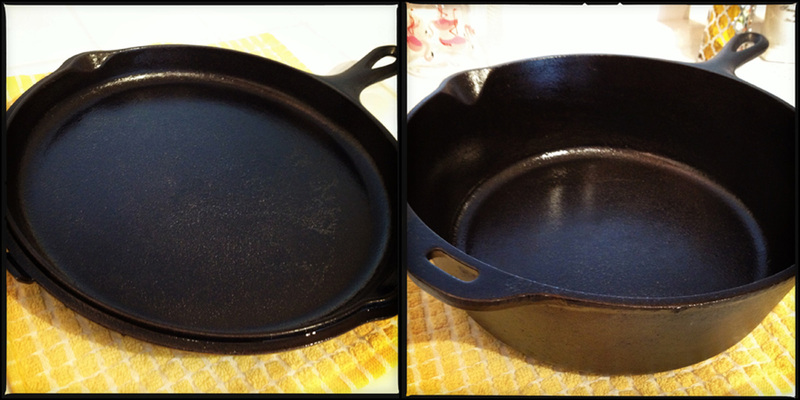 After searching on Craigslist for a couple of weeks, I didn’t find the standard 10″ Deep Skillet that I had in mind. Ok, lies, I found one but it was in South Pasadena, and at that point I wasn’t committed enough to this project to get on the 110, and risk my life to get the skillet. But I did find something that I think is even better! I found this handy dutch oven/griddle pan combo, it was around the corner in West Hollywood, and I haggled it down to $15, can’t beat that. I liked this piece because it was rusty but not too rusty, it just needed a bit of care. And so the process of bringing it back to life began. Some rust, some grime, no rat poop. Thought it was rat poop but it was just some pitting. 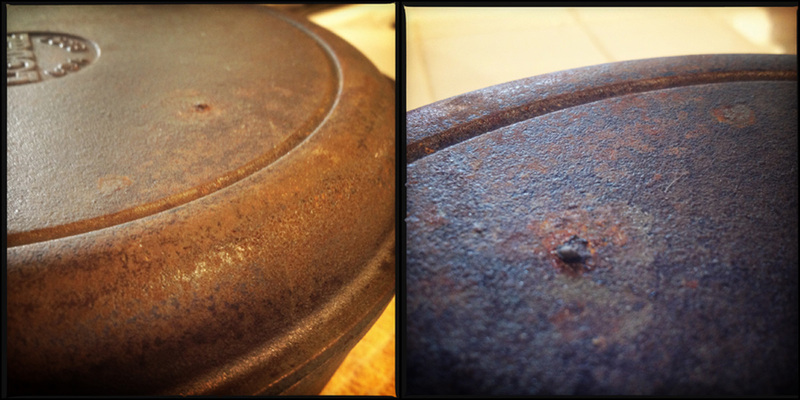 The first thing I learned about reconditioning rusty cast iron pans is that, there’s more than one way to do it. So after a lot of YouTube watching, and Google finding, I narrowed down the methods I wanted to try, and maybe even combine. Tools to get the job done. Also gets the job done if you want to make potato salad. The first method that really caught my interest was the Salt and Potato scrub. It’s just that: you take your dry, rusty pan, you sprinkle a liberal amount of salt on it (I use Kosher, YouTube uses table), and you use a potato cut in half as your scrubber. This method worked well. It did require a lot of elbow grease, which was expected. It did get a lot of the surface rust out, and from what I’ve read, after several treatments, it gets all of the rust out. However, I still had our second method to try. 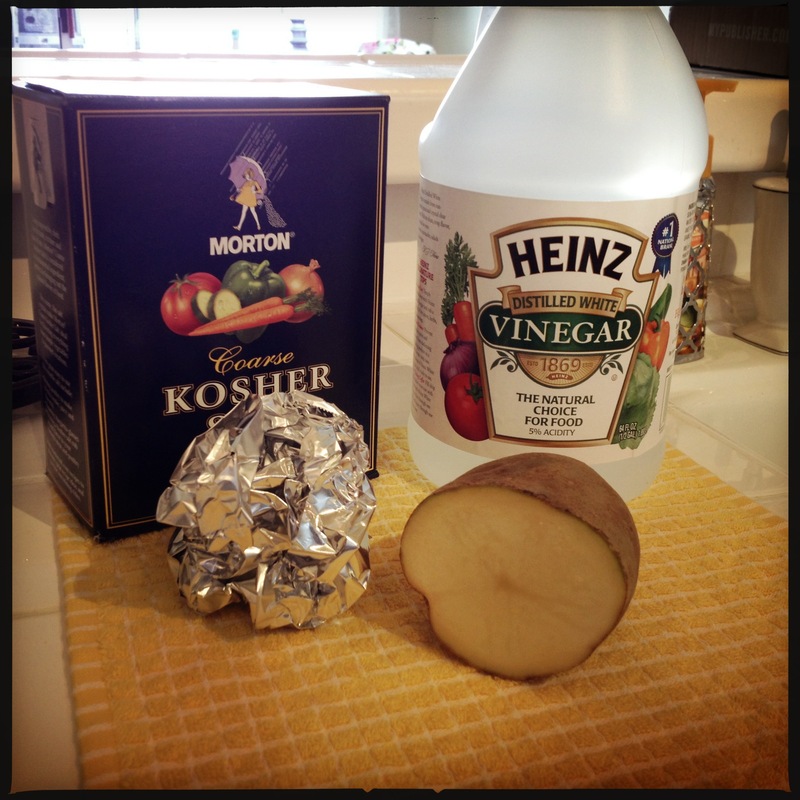 Vinegar and a ball of foil. Yes, a ball of foil. Apparently, the ball of foil is more abrasive than steel wool, so it gets the job done. And guess what? This was my most favorite way of cleaning this thing. The trick is to let your pan soak in vinegar, or a vinegar/water mix, which I kept heavy on the vinegar. For how long? Who knows. Sometimes I let it soak for 10 – 15 minutes, others for 5. But the more I did it, the more rust came out, and I even was able to get rid of some nasty pitting. At one point I threw salt in with the vinegar, and scrubbed it with the foil, but to be honest, I can’t say that I noticed a huge difference. Once all the rust and nastiness was off, I gave it a good rinse in hot water with a small amount of dish soap, and made sure it was completely dry. Completely dry is key here, to avoid it rusting all over again. Ooooh so fresh, so clean. So now it was time to season the cast iron. 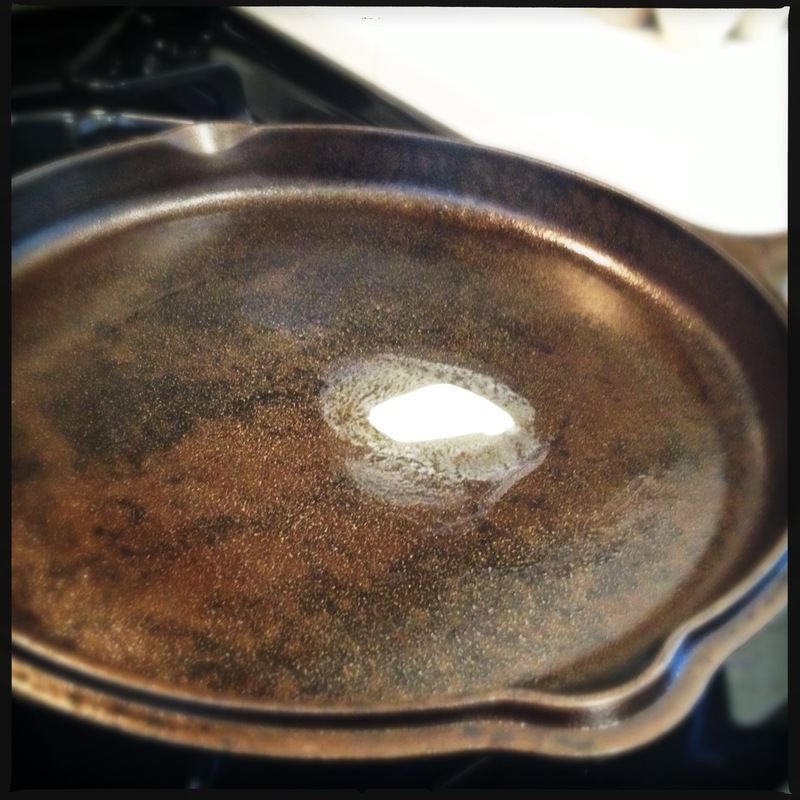 Seasoning is the process of coating your cast iron to begin building the layers that will eventually make it super slick and naturally non-stick. The naturally non-stick part is very important in all of this because Krys has an irrational fear of the Teflon Flu, and thus, no Teflon is allowed in the Melo household. The seasoning had always been the most overwhelming part for me, so I was excited and nervous to try it out. My first resource for information on how to do this was of course, Alton Brown. He’s my culinary hero and God. He has taught me virtually everything I know about cooking and food. At first, I was surprised to not find any information from him readily available on seasoning cast iron. But I wasn’t giving up, so after much Googling, I found an old chat with him from 2000, in which he suggested seasoning cast iron by coating it with Crisco, and leaving it in the oven at 350 degrees for an hour. Easy enough! This is where things get really sad, everyone. The results were disappointing to say the least. My hero had let me down! The pans just didn’t look black enough, not cast iron-y enough, and after doing the fried egg test, they weren’t up to par. Getting ready for the failed egg test. This pan is obviously not ready. Why Alton? Why? To be fair, his advice was probably geared to store-bought pre-seasoned pans. So after going through the grieving process, I did some more research on the subject. And I found a way that made a lof sense for me. The basic concept is this: Heat the pans in an oven preheated to 550 degrees for 30 minutes. VERY CAREFULLY remove the pans from the oven, and rub with a paper towel soaked in really good extra virgin olive oil. I used kitchen tongs to avoid getting my hands so close to the really, really hot pan, because I’m notoriously prone to injury. Once you coat it, turn the oven off, and return pans to the oven with the door cracked for about 10 minutes. I then lightly wiped off any extra oil with a clean (dry) paper towel, again using kitchen tongs, and returned to the oven (which is off, but still hot), and let it sit there for about 30 minutes. Then, I removed them and let them cool. Apparently really hot heat, with a fat that has a really low smoke point does really great things for something called polymerization. Alls I know is that MAGICAL THINGS HAPPENED! The pans came out beautifully black and shiny, like cast iron is supposed to look like! So much better than my first try! Something to note about that low smoke point/really high heat situation. Our apartment got REALLY smoky when I did this. I mean, the dogs were ready to jump off the balcony and save themselves. So please make sure you have proper ventilation. Once these bad boys had cooled it was time for the good ole’ fried egg test. This is the part where you test your work to see how well you’ve done. The goal here is to drop some butter on your pan, fry the egg, and have it not stick. 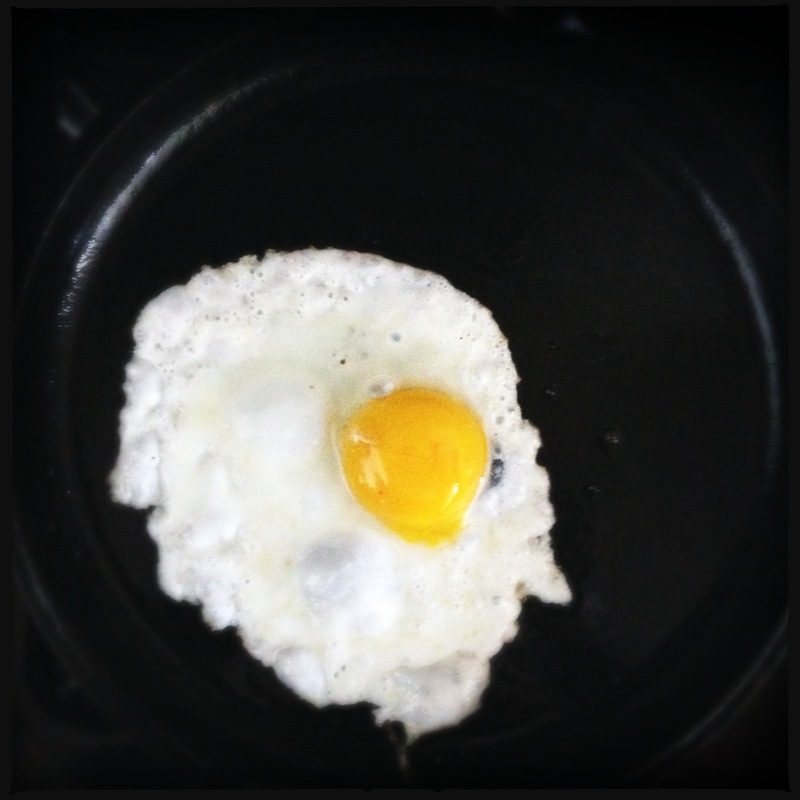 In fact, you want the egg to glide around the pan with ease. This time it was a complete success! Now I’m desperately searching for some cast iron recipes, since the more I use this, the more well seasoned it will become. Do you have any to share? Previous Lucky finds just in time! I bought a bunch of crap last week. 1. Is “So fresh So Clean!” a Strongbad reference? 2. I should have one of these. I too have always thought it was too much…but I guess I’ll just get one, but not from craigslist. Haha thanks! Yeah, if you get a brand new one, Alton’s method should work. Make sure to do it even if it says it’s per-seasoned. Oh, and so fresh so clean was more of an Outkast reference!